Last week, I made the all-call: where do YOU go to free and cheap yoga classes? I got a tremendous outpouring of ideas and am glad to compile them all here for you! I hope you find a new cool place to roll out your mat and soak in the seva (yoga as a service). With that said, if you have any additions or edits, please contact me, or list them in the comment section below! I would also like to address something a couple of concerned yogis brought up to me: cheap and free isn’t always good. I certainly am not advocating that every studio and yoga-related business drop everything and start offering cheap and free classes. Teachers and studios are in business for themselves and need to pay the bills. I’m happy to help pay the bills of my yoga teachers, because they offer me a valuable service that improves my life. I hope everyone feels this way. But there are plenty of good reasons why studios, teachers and businesses do offer complimentary, free, cheap, donation-based, pay-what-you-can, etc. classes. Kashi offers $5 classes taught by their teachers-in-training to give some real-world experience. Active Sol gives proceeds from their Friday Night Vibe class to charities. Lululemon and Atlanta Activewear offer free classes because their clients and customers form a wellness community that extends way beyond business, and bringing people in store for free yoga is a fun way to reach out and foster that community. Nirvana Yoga and Jai Shanti vow to never turn away a student because of price. I hope I show that these are waaaaayyy more than just “free and cheap” classes, but ways for yoga studios to serve in a unique way. So I want to address the concerned yogis when I say that I don’t believe that free is better, or that everyone should fill a week’s schedule with free classes. But when a person really just can’t afford a consistent yoga practice, or just wants to try something new, or meet a teacher they’ve admired, or benefit a community organization–a free or cheap class is a welcome opportunity. And now that I’ve said my piece on that, I’ll say MANY THANKS to the people who do offer these classes! They give us all an opportunity to learn from each other without breaking the bank! Monday 7:00 PM Power Yoga, Active Sol Yoga community class, $7. Tuesday, 6:00 PM Pranalisa with Atlanta Yoga Club, “Stretch, Release, Restore” $5.00-7.00. Little Five Points area, check www.pranalisa.com. Wednesday, 10:00 AM, Dharma I/II class, Ember Yoga, donation suggested. 2nd Wednesday of every month, 11:15 AM, Colony Athletic Club, Free. Saturday, 12:30 PM, “For the People,” Red Hot Yoga in Miami Circle, donation-based. Saturday, 4:00 PM, Hot Sequence, Ember Yoga, donation suggested. Every other Sunday, 4:00 PM, Be Yoga, Marietta Square. Donation suggested. Thank you!!! I am out of work and need to get my body back! I will he trying some of these! 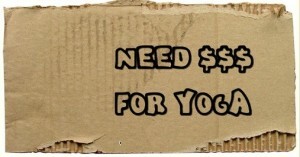 I am a certified Iyengar Yoga teacher and I have two classes weekly that are donation ~ $5-10 is average. Classes run from 6-7am (5:50 for tea) on Wednesdays and Fridays. Please send me an email if you plan to join us as space is limited. Namaste! What a great list! Thanks for doing the legwork! As a teacher and a student, I totally agree with everything you’ve said here about pricing/service. Note that I found out Atlantic Station is considering making their “A Taste of Yoga” a regular event (maybe weekly or monthly). So, keep an eye on their schedule for additional free options.